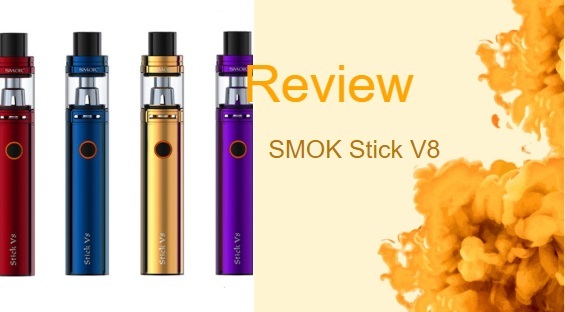 The new SMOK Stick X8 is a reimagining of the SMOK Stick V8, the hugely successful vape pen from SMOKTech. 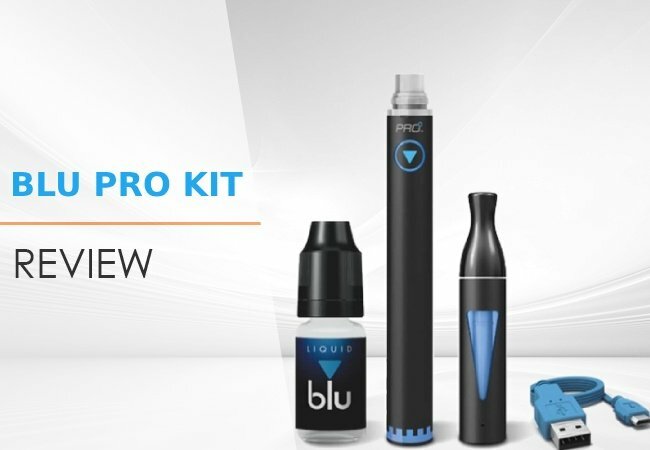 The updated version features many of the same specs that could be found on its predecessor: a 3000mAh battery, roughly the same dimensions, and a pairing with the new TFV8 X-Baby tank that also comes with two sub-ohm coil options. 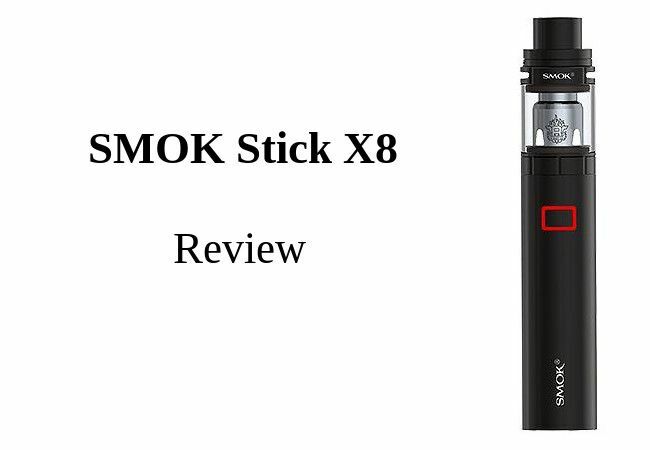 The SMOK Stick X8 does have the same tactile feeling as its older brother, the Stick V8. It has a hard, metallic finish wrapped around a solidly built tube, which comes in eight different color options (black, stainless steel, and rainbow, for just a sampling). The X8 measures 59 mm in height (85mm with the tank attached), and close to 25mm in diameter, and roughly 88g in weight, so, physically, it is virtually identical to the Stick V8. The firing button protrudes quite far and has a nice rubber coating on it – there is one other minor difference between the two, the V8 has a firing circle, while the X8 has a square. A LED indicator light encircles the button and lights up whenever the device is turned on, and its flashes four times whenever you take a puff. When the light starts flashing at a rapid rate, it means the battery is below 3.3V, so it is time to charge it. There is a spring-loaded, gold-plated 510 connector pin on top of the battery and it can accommodate any tank 25mm in diameter. The chipset inside has a bunch of safety features like low-voltage and short circuit protection. There is not much else to about the X8 to describe. It is a little heavy for it to be considered a portable device. But the lack of any other buttons on the mod means that it can easily be put it into a bag or purse even though the paint might get chipped with too many outdoor excursions. There is not much to set up on the Stick X8 to get it ready to vape. The X-Baby tank features a lot of the same benefits as all other SMOK tanks, like a top-fill, swivel top cap to reach the bean-shaped fill port for easy filling. The tank has two, top airflow vents to prevent the possibility of leakage like with bottom, airflow vents. SMOK has also started selling (separately) a Pyrex glass tube extender that will increase the e-juice capacity to 6ml from the standard 4ml, or from 2ml to 4ml for TPD versions. From top to bottom, the new Stick X8 offers as effortless a setup as the previous version of the Stick V8. It is easy to clean and maintain. Unscrew the atomizer base on the tank to remove and replace the coils, or to remove the glass tube for cleaning. It is too bad that neither the SMOK Stick V8 or the X8 feature a mouth-to-lung option to satisfy the MTL hitters out there, but the two coils in the kit work exceptionally well in conjunction with the tank and mod. The X-Baby M2 0.25ohm coil comes pre-installed on the tank. But for extra cloud cover, SMOK has included the X-Baby X4, 0.13ohm coil that vapes best between 45W and 60W. With these two coils and the wide-mouthed Delrin drip tip, SMOK was thinking about impressing cloud-chasers. The X4 coil, along with the response time of the battery and button was cough-inducing, as the vapor comes fast and hard. 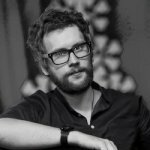 Although there is no mouth-to-lung coil included in the kit, keeping the airflow restricted is enough to mimic a mouth-to-lung hit. The VAIO GO is only a slight step-down from the SMOK Stick X8’s battery and tank capacity. 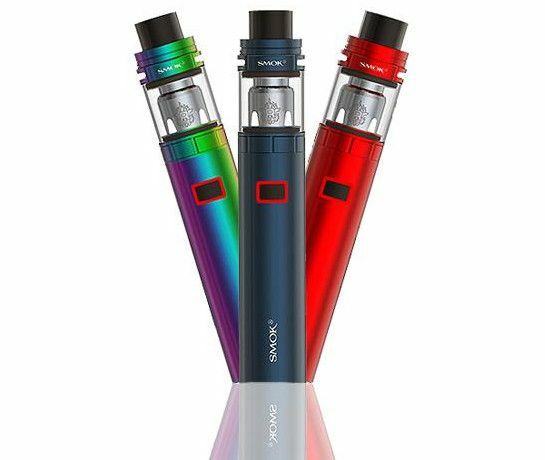 The former features a decent 2000mAh battery and a 3ml tank capacity, compared to the Stick X8’s 3000mAh battery and 4ml tank capacity. So, very similar devices. The two devices even feature some of the same protections, like an automatic cut off time and low-voltage protection. But, it is lamentable that the SMOK Stick X8 did not include a mouth-to-lung coil in their kit – because the VAIO GO does. Not only is there a mouth-to-lung coil, but a mouth-to-lung mouthpiece to pair with your coil. So, while the two devices performed remarkably well, it was the versatility of the VAIO GO, as well as its physical appearance and lighter build that ultimately decided this contest in favor of the VAIO GO. 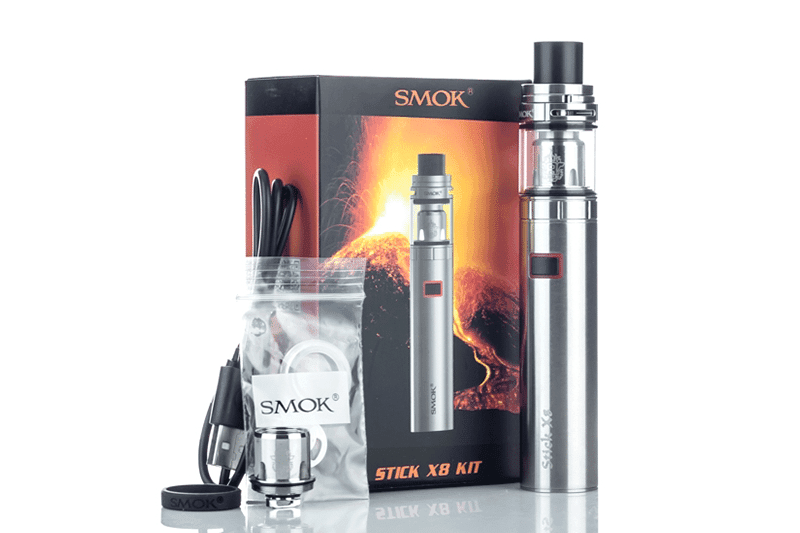 The SMOK Stick X8 is a vape pen, and vape pen mods are uncomplicated simple-to-use devices. The tank and coils are the only things about the mod that can be adjusted or changed; everything else is used as it is. So, of course, the SMOK Stick X8 is easy-to-use, but its performance went a little further than most other pens. The X8 is powerful; it has a long-lasting battery, and although it might not be the most portable of devices, its breezy usability makes it perfect for a beginner.